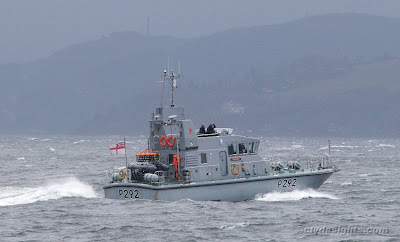 Visiting the Clyde for a few days is the small 'warship' CHARGER, a member of the 'Archer' class attached, like many of her sisters, to a university under the auspices of Britannia Royal Naval College . In her case, CHARGER is attached to Liverpool University. CHARGER, built by Watercraft Ltd at Shoreham, but completed by Vosper Thorneycroft, was commissioned in June 1988. She is a twin screw 20.8-metre long patrol boat with a displacement of 49 tonnes. After initially serving with Severn RNR, she was transferred to the Liverpool URNU in 1990.